O God, by whose grace your servant Ignatius, enkindled with the fire of your love, became a burning and a shining light in your Church: Grant that we also may be aflame with the spirit of love and discipline, and may ever walk before you as children of light; through Jesus Christ our Lord, who lives and reigns with you, in the unity of the Holy Spirit, one God, now and for ever. Iñigo de Recalde de Loyola, youngest of thirteen (one of my sources says eleven) children of Don Beltran Yáñez de Loyola and Maria Sáenz de Licona y Balda, was born in 1491 in the family castle in the Basque province of Gipozkoa, in northeastern Spain, near the French border. As befitted a boy from an aristocratic family, he spent some time as a page at the court of Ferdinand and Isabella, the rulers of Spain. Here, by his later testimony, he was involved in gambling, wenching, and duelling. He got into trouble with the law, but escaped punishment because he was technically a cleric. (This does not mean that he was destined for the priesthood. In those days someone becoming a priest went through seven steps: doorkeeper, reader, exorcist, acolyte, subdeacon, deacon, and priest. The first four were called Minor Orders, and did not involve any serious commitment, but they did make one technically a cleric, which was useful if one got arrested for anything less than murder or treason. Probably many young noblemen took the first step simply as a precaution. Later the law extended the definition of "cleric" to anyone who could read. See the BIO notes on Thomas a Becket, 29 December.) He then entered military service, but fought in only one major battle, the defense of Pamplona against the French in 1521. The professional solders knew that their position was indefensible, and proposed to surrender. Iñigo (or Ignatius, to give him the Latin form of his name) had visions of military glory, and urged his comrades to fight. He was promptly hit in the leg by a cannon ball, the town surrendered anyway, and the French sent him home on a stretcher. The leg was badly set, and did not heal properly. It had to be rebroken and reset, and again it healed crookedly and left him with a permanent limp. Meanwhile, he was bedridden for many months, and spent the time reading. He asked for tales of knightly adventure, but instead was given a Life of Christ, written by a Carthusian monk. He read it, and his life was transformed. He went on pilgrimage to Montserrat (near Barcelona), where he hung up his sword over the altar, and then spent about a year at Manresa near Montserrat first working as a nurse and orderly in a hospital there, and then retiring to a cave to live as a hermit and study The Imitation of Christ, by Thomas a Kempis, a book urging the Christian to take Christ as example, and seek daily to follow in His footsteps. It is probably during this year that he wrote his Spiritual Exercises, a manual of Christian prayer and meditation. He directs the reader to begin with an event in the life of Christ, and to imagine the scene in detail, to replay the episode in his mind like a movie script, and to try to feel as if he had himself witnessed the event, and then to use this experience as a motive for love, gratitude, and dedication to the service of God. The book is available today in hardcover and paperback. It has been much used by Christians of all varieties--John Wesley was enthusiastic about it. 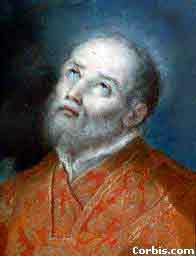 Ignatius then made a pilgrimage to Jerusalem to see with his own eyes the scenes of Our Lord's life and death. He wanted to stay and preach to the muslims, but the Franciscans stationed there advised him that he needed an education in order to preach effectively. Back in Spain, he spent ten years (1524-1534) getting an education at Barcelona, Alcala, Salamanca, and Paris, beginning by going to elementary school to learn Latin grammar, and ending with a Master of Arts degree from the University of Paris. In Salamanca, he often preached to groups of people assembled by chance; but in those days a layman undertaking to preach on his own, without a license or supervision, was automatically suspected of heresy. Ignatius was twice imprisoned by the Spanish Inquisition and questioned about his beliefs, an experience that made a deep impression on him. (He was finally acquitted, but forbidden to discuss religious matters for three years.) Today, his followers are aggressively proud of the fact that no member of their order has ever sat on an Inquisitorial tribunal. 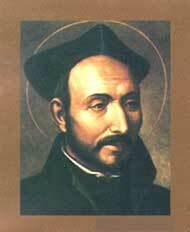 (It is possible that Ignatius already had doubts about the Inquisition. He was a Basque, and I am told that the Inquisition was never active in Biscay because the Basques, although thoroughly orthodox Christians, would not tolerate it.) In 1534, he and six fellow students formed a group who vowed to travel to Jerusalem and there preach the Gospel to the moslems. (The most famous of the six is Francis Xavier, who went to India and China as a missionary, and who is commemorated on 3 December.) This group later took the name, "The Society of Jesus," and were nicknamed "the Jesuits" by outsiders, a nickname that stuck. (c) a suitable response to the growing challenge of Protestantism.